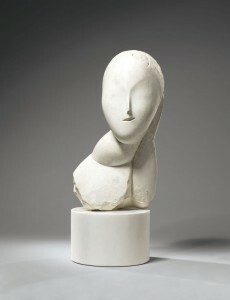 Brancusi initially carved Une Muse in 1912 in marble (Guggenheim Museum, New York), and within months produced two versions in plaster. The work is part of the series of sculptures inspired by Baroness Renée-Irana Frachon, who had modeled for the artist in his Paris studio in 1909-1910. Like the first work in the series, Muse endormie, Une Muse presents a vision of woman as inspiration and also conveys the essence of female beauty. But this work is more sculpturally complex than Muse endormie—the ovoid-shaped head is now animated, positioned upright and supported by an elegantly curving neck and abbreviated torso. The two known plasters of Une Muse were both purchased directly from the artist by Walt Kuhn and are currently in private collections. 3 The 1912 marble original was included in Brancusi’s first solo exhibition in the United States, mounted in 1914 by Alfred Stieglitz at his 291 gallery, where it was purchased by another Armory Show co-organizer, Arthur B. Davies. The marble was given to the GuggenheimMuseum in 1985 and remains in its collection. “‘Cubists and Futurists Are Making Insanity Pay’: Kenyon Cox, Member of the National Academy, and Recognized Here and Abroad as One of America’s Foremost Painters, Gives a Straight-from-the-Shoulder Opinion of the New Movements in Art,” New York Times, March 16, 1913, SM1; and “Art Extremists, In Broadsides of Lurid Color, Invade New York and Capture an Armory,” New York Herald, February 17, 1913, 10. J. Nilsen Laurvik, “New Paths in Art,” The International 7:4 (April 1913), 89-90. Kuhn’s widow gave both plasters to the GuggenheimMuseum in New York in 1955. The Guggenheim sold one in 1979 and the other in 1986. The Romanian-born sculptor Constantin Brancusi is widely considered the leading pioneer of modernist sculpture. Working to reveal the essence of his subjects rather than merely copying outward appearances, he introduced abstracted, non-literal representation into the sphere of sculpture. In doing so, he established himself as a key figure in the Parisian avant-garde, while also gaining international notoriety among artists, critics, and the public. Brancusi’s mature style began to emerge about 1907, as his work became increasingly simplified and abstracted. Unlike Rodin, who emphasized theatricality and the accumulation of detail, Brancusi suppressed decoration and explicit narrative references in an effort to create pure and resonant forms that captured the essence of his subjects. His technique is also noteworthy—unlike most of his contemporaries, he focused on direct carving in marble and stone rather than modeling in clay or plaster first. This allowed him to move toward a purification of form, a focus on the essential. He created his first major work carved directly from stone, The Kiss, in 1907-1908.